Our new diamond-coated ProxiDisc® is a stainless-steel proximal separator disc with a fine diamond-coating on one side to help in adjusting tight contacts or removing excess materials from one tooth only, while the smooth surface on the opposite side protects the adjacent tooth. 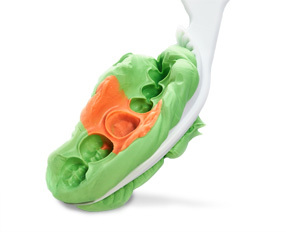 Using a firm rocking motion, roll the ProxiDisc through the contact area with pressure to remove excess material trapped in interproximal area. After use, the ProxiDisc may be sterilized and disinfected. Packaged in a canister of four.